Le mix que j’ai créé pour webSYNradio inclut des pièces musicales et des sons issus de field recordings ou s’attachant à l’environnement sonore, dans des endroits abandonnés, isolés ou difficiles d’accès. D’une certaine manière, tous font passer les sons de la sphère inaudible à la sphère audible jusqu’à l’oreille de l’auditeur. Robert Curgenven réveille les orgues dans différentes églises de Cornwall, Hans Peter Kuhn transforme un tunnel à Leeds en un couloir résonnant dans une composition en constante évolution de 8 canaux. Le paysage sonore d’Alyssa Moxley est un field recording d’un ancien rituel «La Grande Bénédiction des Eaux» joué chaque année à Athènes, Peter Cusack a effectué un enregistrement dans le territoire abandonné et désert de Tchernobyl réveillant un instrument oublié dans le conservatoire local. Karen Power crée un paysage sonore qui mélange les sons de la fonte d’un glacier au Groenland avec les sons d’une rizière au Laos. Kristina Kubisch révèle les sons cachés de l’environnement urbain grâce à des enregistrements de champs électromagnétiques. Ma pièce renferme les sons cachés dans l’environnement dans l’île de Madère ainsi que des sons méconnus dans l’environnement urbain de Berlin. The mix I created for webSYNradio involves music and sound pieces which are based on field recordings or relate to the sound environment in either abandoned, secluded or difficult to access places. In some ways all of them transform the sounds from the inaudible to the audible sphere and bring them into the ear of the listener. Robert Curgenven awakens pipe organs sounds in different churches in Cornwall (uk), Hans Peter Kuhn transforms a tunnel in Leeds (UK) into a sounding corridor in an ever changing 8-channel composition. Alyssa Moxley’s soundscape is a straight field recording of an ancient ritual ‘The Great Blessing of The Waters’ performed annually in Athens, Peter Cusack made a recording in the derelict and deserted territory of Chernobyl (ua) awakening an instrument forgotten in the so called music room, Karen Power creates a soundscape mixing the sounds of the melting glacier in Greenland and Laotian Ricefields. Kristina’s Kubisch reveals the hidden sounds of the urban environment through electro-magnetic field recordings. My piece encloses the sounds hidden within the environment in the island of Madeira (pt) as well as mostly ignored sound from within Berlin urban environment. Recorded on the 6 of January, 2015 during the Great Blessing of the Waters, in Piraeus port Athens. Theophany (god made manifest) or Epiphany is a day where many people cleanse their religious icons in bodies of water, as the waters themselves are said to be free of the tormenting goblins of winter. This is when sailing is good again as well. Traditionally a cross is thrown into the sea by a priest and men (usually) clamber to retrieve it for good luck. Here all of the boats of the port were sounding their horns at once, complemented by church bells. The horns’ calls bounced off the concrete walls of the port and created interference tones. This is a straight field recording with no layering. In sounding water Karen Power combines her interest field recording, our worlds natural timing, musical structures and the performance space, in a partially improvised and composed laptop performance based on water in its many states. The emphasis of this live electronics performance is on highlighting the many audible and inaudible features of water in all it’s various states – from the frozen Arctic ice-waters to the fluid-flowing Irish Blackwater River and the deafening underworld in the Laotian ricefields. Karen’s partially-improvised soundscape performances uniquely create simultaneously real and imaginary soundscapes for audiences to wander and explore. 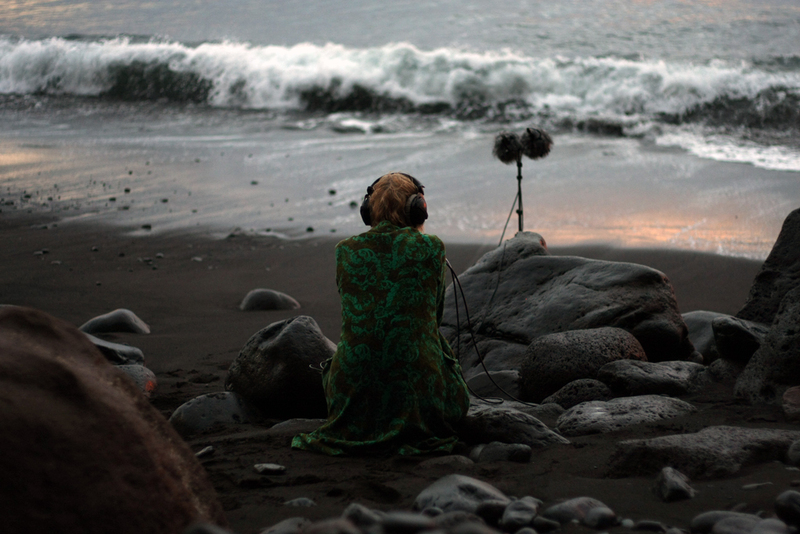 She specialises in using audible and inaudible environmental and every day sounds, all of which she has recorded from around the world, as catalysts for constructing multiple sonic paths and soundscapes, which could not physically coexist outside of each artist-made performance space. Karen’s intention is closely aligned with her compositional practice and a desire to play with that fragile space, which lies between the comfort in recognising a sound and your personal association with it, and the wish to move beyond this into hearing new sonic possibilities for that same sound. Audiences are invited to find their own way into each and every sound. Sounding Water will be diffused through a quadraphonic system and uses only field recordings of water. This is a short excerpt of an ever changing composition that is playing in a street tunnel in Leeds (UK). It is a collection of approx. 500 short 8-track loops that get mixed randomly in a way that the same combination will not be repeated within the next 20 years. This recording is a stereo mix of a few minutes of this ongoing piece. from: Robert Curgenven’s Sirène: Selected Pipe Organ Works 1983–2014 (LP, out on Recorded Fields). Robert Curgenven’s material is entirely pipe organ sounds taken from the churches at Lanteglos, Lelant, Ludgovan and Towednack and if those names means nothing, or suggest Brittany rather than England, that’s a useful measure of how beautifully universalised is the composer’s use of a found material: a set off field recordings from the edge of the UK, taken to Australia (where Curgenven lived for many years, and where many Cornishmen ended up when the china clay ran out or proved to brutally mercenary a trade) but not processed. The main addition of the recordings is a little EQ: The art is all in the layering of the sounds, pipe on pipe, phantom chords and overtones. Cornubia is latinised version for Cornwall. The piece ‘Music Room” belongs to the project ‘Sounds From Dangerous Places’ released in 2012. ‘The Music Room’ is one of the abandon spaces in Chernobyl, a place that became a ghost city after the explosion of the nuclear reactor in 1985. Is a site-specific piece, which has been composed entirely from the field recordings pursued in the Island of Madeira, Portugal. It has been presented in as a part of a multichannel sound installation on-site in December 2014. The piece juxtaposes sonic traces related to human activity on the island such as sound of ventilators, water dam (floodgate) with the natural phenomena such as wind movement, statics of beach stones and the tranquility of the ocean referring to those elements as respiratory processes, not overtly noticeable but somewhat intrinsic to the existence of this place. It is an attempt to map sonically this self-contained territory and awake in listeners a notion of getting into contact with a live creature – the island, which exhales and inhales keeping itself alive. Ice sculptures holding speakers and microphones inside create dynamic feedbacking soundscapes. Each sculpture processes and regulates its own escalating feedback differently. Since the ice objects are rooms that contain the feedback, as they melt down the features of the feedbacking system change, thus changing slowly the characteristics of the feedbacking patterns and the sonority of the piece through time. Its a collection of social electromagnetic places which are already premixed. You can cut out what you want, have them between other pieces as interludes and/or play them as a sequence. Première écoute : à partir du jeudi 27 avril à 20h jusqu’au 10 mai 2017 même horaire. Martyna Poznańska est une artiste interdisciplinaire vivant à Berlin. Sa recherche artistique porte sur l’écoute et l’ouïe comme acte de transformation de l’environnement sonore urbain. À travers ses installations et spectacles en direct, elle étudie les effets et interactions entre différents modes de perception, où l’expérience de l’auditeur devient le point focal. Sa pratique implique le field recording, l’écriture, la vidéo et la photographie. Martyna a montré ses œuvres à l’Akademie der Künste Berlin (DE), Spor Festival (DK), Deutsche Oper Berlin (DE), The Place, London (UK), Cafe OTO, Londres (Royaume-Uni), elle a travaillé avec Hans Peter Kuhn (Installation – Übergang) et Peter Cusack parmi d’autres. En 2013, elle a été récipiendaire d’une subvention du ministère polonais de la Culture pour le projet Listening East. Martyna Poznańska is a cross-disciplinary artist based in Berlin. Her artistic research focuses on listening and hearing as a transformative act within the urban sonic environment. Through her installations and live performances she investigates the transience of the affect between different modes of perception, where the listener’s experience becomes the focal point. Her practice involves field recording, writing, video and photography. Martyna showed her works at the Akademie der Künste Berlin (DE), Spor Festival (DK),Deutsche Oper Berlin (DE),. The Place, London (UK), Cafe OTO, London (UK), she worked with Hans Peter Kuhn ( Installation – Übergang), and Peter Cusack among others. In 2013 she was the recipient of a grant from the Polish Ministry of Culture for the project Listening East.